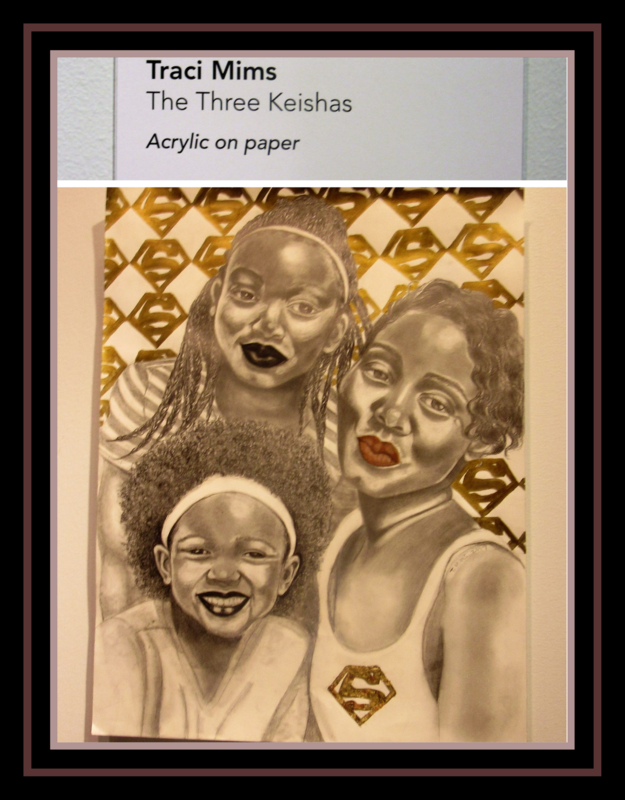 Kesha is an exhibit currently showing at the (downtown) Jacksonville Public Library. As you can see, the exhibit displays intersections of gender and race, hence the title, Kesha. However, some works are clear portrayals of the impact of systematic African American oppression. Shout out to Shawana Brooks for an amazing concept. This is a very small sample of what the exhibit offers. If you’re nearby, then plan a visit. It runs until late April. These are very STRIKING images! BOLD! I love it. I know right? Lady G sitting up here trying to figure out how to get her hustle on. LOL!!! Once I get that straight, I can fangle on over that-a-way…LOL!!! This is an amazing idea for an exhibit. The artwork is beautiful. I think my favorite is the second – that Kesha looks so powerful. But I love TheThree Keishas, too. It’s sad you can’t see the faces of those in the last photo, but one. Thanks for sharing, Kathrin! Thanks Kim! The last one is made of wood. You know pictures rarely capture the magic of the actual artwork in person. This is a powerful display. I have a cousin who lives in Jacksonville, I’ll have to ask her if she’s been to the exhibit. Please do! The city is doing a much better job of representing its demographic and I think the least we can do is show up. Amen to that!! Sounds like it’d be a good outing to share with her daughter. Thanks for sharing. Beautiful art. I love art that has a message. Me too! Wish I could’ve posted all of the images. You’re in Fort Lauderdale??? It’s only 4 hours lady lol Let me know if you make it up this way! Beautiful concepts and use of color. Thank you for sharing! Sheesh! I don’t about that Tareau lol maybe you’ll have to find a black exhibit in the Bay Area…if such a thing exists. If I can recall you were writting a book right? Thanks so much! I discuss one woman from the book in-depth on the second Friday of the month.